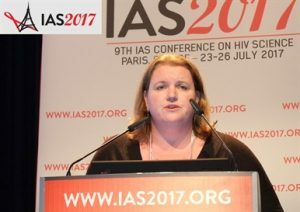 The IAS2017 Conference on HIV Science held in Paris in July highlighted the progress made internationally to eradicate AIDS. But it also emphasised that we cannot be complacent and we need to roll up our sleeves to maintain momentum. Nearly 8000 researchers, advocates and policy makers came together to demonstrate that the science that comes out of research centres such as the Desmond Tutu HIV Centre (DTHC) do impact on public health policy and save lives. Globally, 36.7 million people were living with HIV in 2016. 19.5 million of these are now accessing antiretroviral therapy (ART). (1) AIDS deaths are almost half what they were in 2005 thanks to the research, interventions, and treatment over the years. However, with over 17 million HIV-positive people not accessing ART, there is still much to be done. Deputy Director of the DTHC, Professor Linda-Gail Bekker, is the current President of the International AIDS Symposium. She gave the opening address at the conference. Bekker commented during the speech that “New prevention options are helping us really move forward to reducing transmission,” and the latest prevention tools were generating a lot of buzz. The HIV prevention pill, Truvada or PrEP (PreExposure Prophylaxis), has been tested for the first time in adolescents in an African context and found to be safe over a twelve month program. These findings were presented by Dr Katherine Gill also from the DTHF, who presented her research in the ‘PlusPills‘ study. The study shows promise that with focused and funded intervention, the drug Truvada (PrEP) can prevent new HIV infections in adolescents. The results from a short-term immunisation trial were well-received.The immunisation is achieved from a drip thatcontains an infusion of HIV antibodies. There is hope that this may lead to an infusion injection every two months instead of a daily HIV prevention pill. Additionally,there may also be a similar, injectable antiretroviral treatment that will be long-lasting and replace daily HIV suppression medication.